I had read that “suddenly” is a bump-word for editors, but I hadn’t given it much thought while revising my manuscript of Fate Accompli. However, a couple of beta readers, Effrosyni Moschoudi, author of The Lady of the Pier among them, mentioned the no-suddenly rule. I did a quick FIND search and saw I had 36 “suddenly’s” in my 96,000-word story. That didn’t seem too much, but for the sake of practice, I decided to look into doing away with at least some of them. By default, a sudden occurrence cannot be non-sudden. That was clearly redundant as when one “shoots to her feet” it has to be a sudden movement. One cannot appear out of thin air in a non-sudden manner, so that one went away. Before: “For years, he’d been unable to notice any of the stuff that was suddenly visible”. Nevertheless, there were several instances where I couldn’t get rid of “suddenly”—and didn’t want to. I realized that the common denominator was that they were all a sudden change of emotion, change of mind or a non-clear-cut sudden occurrence. I did some digging and found that, indeed, even hard-core editors accept that when a character’s mood abruptly changes, “suddenly” enhances this shift. So here are some phrases where “suddenly” stuck. Nothing can “erupt” non-suddenly, so even though there’s a sudden change of feeling, the verb suffices. And then there are the cases where “suddenly” could (should?) be removed, but I just didn’t do it. Because I can. That was my takeaway from that editing exercise. For an editor’s view on the subject, check out K.M. Weiland’s article. 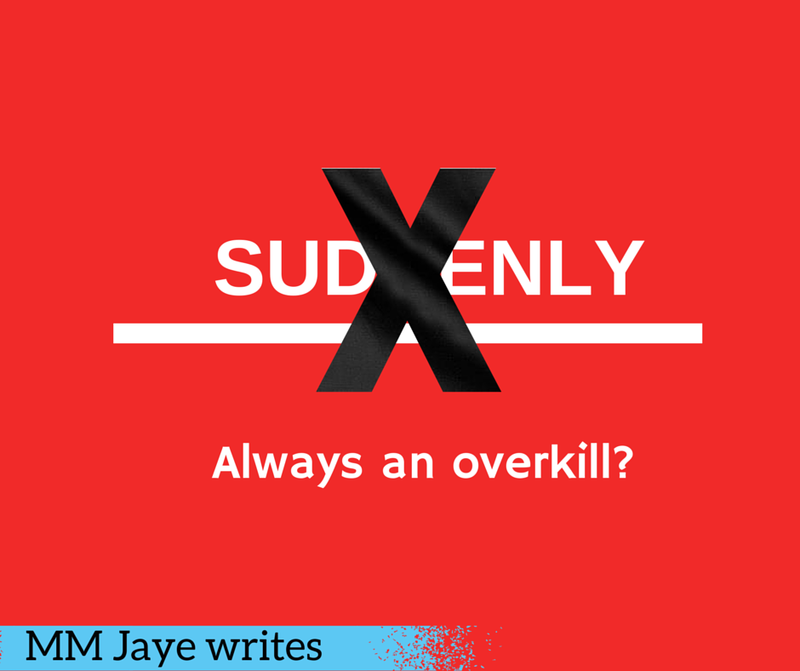 Do you consciously edit out “suddenly” from your writing? Is it on your editing check list? Let me know with a comment. That was one of my, but it got phased out somehow. I think every author has a handful of words that they unknowingly use too much. The mind gets hooked on the impact that they have and we only notice the over use if we write nonstop. At least that happens with me. You have a lot more books under your belt, Icky. I’m writing my second and it, well, seems that “seems” is becoming my pet peeve, too! Thanks for the comment! Suddenly is one of my pet hates, and I usually catch myself before I write it now. I find it is massively over used in children’s picture books. Hear, hear! Thanks for stopping by! What a great post! I love how you distinguish between the various usages of the word, and keep some of them, while eliminating others. Great job! But, you see, Vigil is the fourth book in the Pearseus series and, what? Your sixth overall? It shows that the more experienced your writing is, the more you subconsciously deal with nuisances. Thanks for stopping by! Thanks for reminding me, through your interesting post, to check my WIP for the “naughty” word! Ah, you see, I’m conscious of “however”, I became conscious of “suddenly”, now I have to become conscious of “it seemed”. Agh! Suddenly – huh – a greatly hated word, LOL. But somehow, we all use it. I find it in books of successful authors even. Thanks for the mention, yes, I stumbled upon that rule early on but decided not to follow it strictly. Rather, to treat it as any other word that shouldn’t be repeated overly. I have the tendency to use the word ‘chuckle’ more than any other. My husband breaks in hives when he sees it, as he edits my MS. It’s the repetition that annoys the reader, not the word, any word, I am sure. Hear, hear! Once you become conscious that a writer uses a certain word again and again, it bumps you. I read a novel where “he cut her eyes to her” was used a lot. After the fourth time, it drew a negative reaction out of me… Thanks for the comment! I like the edits you did, and even the instance you chose to keep ‘suddenly’ in the sentence. When I try to rewrite a sentence to omit a word or phrase, it seems I go into a brain freeze. It takes quite a bit of effort to re-channel thinking or to even recognize the repetitious or unnecessary words used.